In the two-and-a-bit years I've been writing Books Under Skin, by far my most blogged about author is Roald Dahl. It's strange, really, since this isn't a blog specifically for YA or remember-when literature, but it was through reading his books that I think I first became aware of what he was doing as an author. I'm not talking about a formula – those were revealed to me through the may yellow-spined Nancy Drew books I read – but rather the idea that he was trying to pass on a notion of how the world could be. Although most of his stories ended happily, that was only brought about by a character's ingenious plan and/or hard work, suggesting that more than just luck was involved. Anyway, I loved it and I'm pretty sure I've read every one of his children's books as well as some of the ones he wrote for adults. I also read both his "autobiographies" – quotation marks because, true to style, Dahl wasn't against flubbing some of the details to make a story more fantastic. All of which is to say that when Donald Sturrock's biography of Roald Dahl, Storyteller: The Authorized Biography of Roald Dahl came out, I went right out and bought it. An authorized biography, I discovered in a Q&A I did with Charles Foran (author of Mordecai: The Life and Times), means that the subject or his/her estate has a say in the final product. That is, in return for access to all the personal documents and letters and whatever, they can theoretically veto something they don't like. I only mention this because, as an authorized biography, Sturrock's not only seems remarkably thorough but also not all that pandering. Dahl was notoriously reclusive when it came to his writing life and shy about talking to the press, and, considering how watered-down (though hilarious) his autobiographies are, it's quite something to see his life laid out like this. Sturrock starts at the very beginning – actually, before the very beginning, because he starts with Dahl's Norwegian ancestors. He traces the Dahl family back to a minister who managed to escape an otherwise deadly church fire by climbing out a window. He then goes on to detail the life of Dahl's father and mother, and then gets to baby Roald. You wouldn't think that someone else's family history could be so engrossing, but it's quite a story. Quite a few of the stories of Dahl's childhood are told, in one form or another, in Boy: Tales of Childhood, but Sturrock goes the extra mile of filling in the family background around the funny anecdotes already known to Dahl fans. The affect is like sitting down at the dinner table with a friend's parents, where stories you're familiar with are retold with more complete context. Thus, Dahl's boarding school education is less rosy and his eventual career as a writer somewhat less surprising. It seems obvious, but Storyteller is very linear. Besides alluding to Boy and Going Solo, the rest of Dahl's stories are mentioned in more or less chronological order, which means the majority of the book is all about the time that Dahl wasn't writing – his time as a kind of spy in New York, for example, and all the women he seduced. James and the Giant Peach doesn't appear until over halfway through, after he has spent many years as a frustrated short story writer. Sturrock also details his marriage to Patricia Neal, and doesn't sugarcoat how unhappy it became. But although Dahl does sometimes come across as a brute, he is never the kind of ugly villain he wrote about. Sturrock's portrayal of Dahl's grief at the death of his daughter and subsequent horror at the accident that nearly kills his infant son feels extremely honest. For all the love Dahl had for children, he was an awkward and sometimes unfeeling parent, and Sturrock does not hide that side of him. In some ways, reading Storyteller is a shock. It's easy to think of Dahl as a kindhearted and imaginative man who spent his days dreaming of ways to entertain children, but I think it's much more compelling to find out that it wasn't that simple. 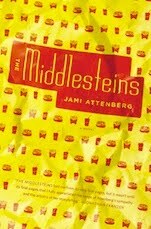 Reading about a beloved writer is tough because, if you're not careful about it, you can ruin your fond memories of their books by learning too much. In the case of Dahl, though, it's not so easy. Many of his books hold great distain for all by a select few adults, and the more you learn about his life the more difficult it is to decide what kind of adult he saw himself as. That tension is likely what made his books so unique in the way they managed to entertain children on their own terms; Dahl never felt like being an adult was better than being a child, and therefore was able to write for kids without writing down to them. 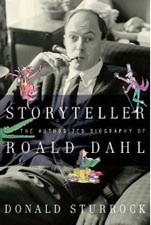 Like Dahl, Storyteller is a lot to talk about and a not easy to pin down – so maybe it's best to just read it yourself. This is such good advice! And it gives me comfort to know another writer who doesn't write systematically same amount of time each day.